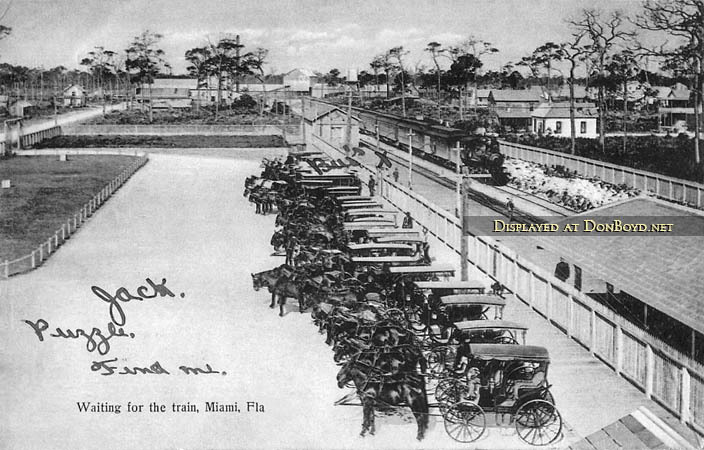 The father of Miami, Henry Morrison Flagler (1/2/1830 - 5/20/1913), of Standard Oil fame, brought his Florida East Coast Railway south from West Palm Beach to Miami in 1896 and that coincided with Miami incorporating into a city. The first FEC station, pictured above, was on NE 6th Street between Avenue "B" (now NE 2nd Avenue) and what is now Biscayne Boulevard. Flagler built streets, instituted Miami's first power and water systems, dredged a channel and financed Miami's first newspaper titled "The Metropolis." The citizens wanted to name the city "Flagler" but he declined the honor and suggested that they name it the old Indian name of "Mayaimi." Flagler built the famous Royal Palm Hotel on the north bank of the Miami River entrance in 1897 where the old Fort Dallas was located. This site later became the DuPont Plaza and is now having a new development built on top of those sites. See http://en.wikipedia.org/wiki/Henry_Flagler for much more fascinating information about Henry Flagler.